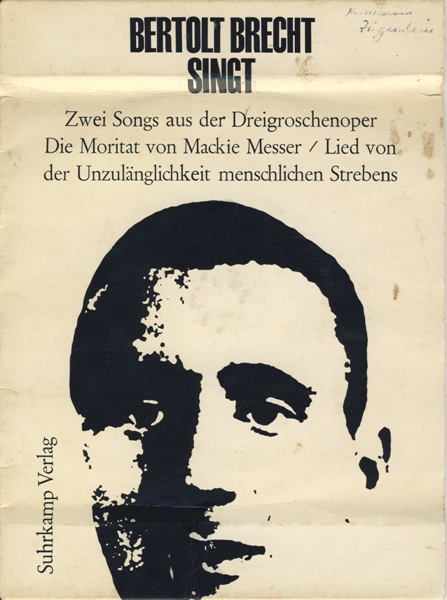 Since 2008, a recording has been making the rounds on YouTube of Bertolt Brecht singing 'Die Moritat von Mackie Messer,' or what's more commonly known as "Mack the Knife" in English, a song Kurt Weill and Brecht composed for The Threepenny Opera, which premiered in Berlin in 1928. The Brecht recording dates back to 1929, and, according to Discogs, it was released in 1960 on a 7-inch German album called Bertolt Brecht Singt. Below, you can hear Brecht make his way through the tune. The clip comes accompanied by a quirky, new animated video created by the studio Quality Schnallity, Inc.
"Mack the Knife" has, of course, been covered by countless artists over the years. Bobby Darin sang perhaps the most famous, swinging version in 1958. There are also classic versions by Louis Armstrong, Frank Sinatra, and Ella Fitzgerald, not to mention more contemporary ones by Lyle Lovett, The Psychedelic Furs, The Young Gods, Nick Cave, and Marianne Faithfull. Did we miss one of your favorites? Cute video. Delightful recording. They did, however, spell Bertolt wrong. I suppose the creepy palm eyeballs put forth a noble effort to distract us from that error. I am so surprised that nobody mentions that this song was used by Ernie Kovacs on his television show in the 1950’s. He had an oscilloscope on the screen while this song played in between the skits. Amazing. U missed the one by Lenya Lotte!